Manjima Mohan is an upcoming actress who has started her career as a child artist. She works primarily in Malayalam film industry. She has even won a Kerala State Film Award for Best Child Artist in the late 1990s for her performance in the movie Madhuranombarakaattu. Later, she took a break to concentrate on her studies. After the hiatus, she made a comeback in the film industry with the flick Oru Vadakkan Selfie. The profile and autobiography of Manjima Mohan are being discussed here. Manjima Mohan was born in the year 1993 to Vipin Mohan and Kalamandalam Girija. Her father is a cinematographer and her mother is an accomplished dancer. She had her schooling from Nirmala Bhavan Higher Secondary School in Thiruvananthapuram, Kerala. Later, she took her bachelor's degree in Mathematics from Stella Maris College in Chennai, Tamil Nadu. Since her father was a cinematographer by profession, the talk of cinema was very much there in her house. Moreover, she has developed an affinity for dance due to the influence of her dancer mother. The actress Manjima Mohan is not new to the world of cinema. She was active as a child artist from 1998 to 2002. She made her first celluloid appearance at the tender age of 5 years in the movie Kaliyoonjal. In this film, she portrayed the childhood of the character played by noted actress Shobhana. She continued to work for another three years as a child artist. In these years, she appeared in the flicks such as Priyam and Maduranombarakaattu. It was due to her performance in the latter she got the Kerala State Award for Best Child Artist. During this active period, she also hosted a television call-in show for kids by the name 'Hai Kids'. She also appeared in another film by the name Thandavam before taking a break for completing her studies. After 2002, the young Manjima Mohan took a break to concentrate on her studies with the consent of her parents. Since then, she has been concentrating on her studies and doing well just like other kids of her age. The cinema again came calling her at her doorstep when she was in her final year at the Stella Marias College in Chennai. The offer was to act in the movie Oru Vadakkan Selfie. The director of the movie G. Prajith approached her with the script and read it out to her with explanations. After hearing the script, the young Manjima Mohan decided to be part of the project despite her intention of not coming to the world of celluloid immediately after her studies. Later, the upcoming actress confided during an interview that she really fell in love with the script of the flick and the character Daisy in it. On consulting the script, the young Manjima Mohan fell in love with the script and the character Daisy in the movie. Hence, she decided to participate in this project. When she was approached with the offer, the upcoming actress was not keen on resuming her career as actor immediately after the degree. The actress was specifically interested in the poised, bookworm and silent character posed by Daisy in the movie. After the film was released for the worldwide view, the actress told the media persons that the character Daisy enacted by her possessed the characters just opposite to what she had. Due to this reason, she had difficulty in enacting the role in the initial days of shooting despite of having hands on experience in the profession since her childhood. The script of the flick was written by the noted actor and singer Vineeth Srinivasan. In this film, she acted opposite to the Nivin Pauly. The flick opened to the positive reviews by the critics and the general public. Banking on these laurels, the movie went on to become the first box office hit of 2015 in Malayalam film industry. The success of the film Oru Vadakkan Selfie has opened a barrage of opportunities for the young actress Manjima Mohan. Among the many opportunities that came knocking at her doorstep includes that of the Malayali movie director Gautham Menon. The director liked the actress' performance in her maiden Malayalam flick in her second innings. So, the Kollywood director Gautham Menon called her for an audition. Since she has the filmy background, it was a cake for her at the audition venue. The name of the Tamil movie is Achcham Enbadhu Madamaiyada. In this flick also she has been given the title and pivotal role to enact before a totally different audience. The actress Manjima Mohan is an upcoming actress. She is primarily active in Malayalam film industry. Of late, she has forayed into Kollywood with her debut movie Achcham Enbadhu Madamaiyada. The acting is not new to her as the actress had made previous appearances on the silver screen as a child artist in a number of movies. As a child artist, she was active in the industry from 1998 to 2002. Her performance as a child artist got a recognition in the late 1990s. She got the coveted Kerala State Award for Best Child Artist for her acting performance in the film Madhuranombarakaattu. Later, she went into a hiatus to focus on her academics. During her final year of the degree course, she got an offer to act in a movie directed by G. Prajith. She got hold of the opportunity as she liked the script and the character of the flick Oru Vadakkan Selfie. The film got released to the positive review by the audience and the critics. Therefore, the movie went on to become the first Box Office hit of Mollywood in 2015. 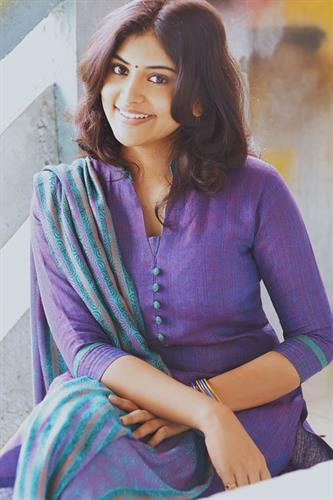 Her success in this flick helped her bag an offer from another director Gautham Menon, who was looking for a fresh face for his project in Tamil by the name Achcham Enbadhu Madamaiyada. Let us see how she branches out to carve her niche in the field of acting.